Phase changes occur because of changes in temperature and/or pressure. Phase changes are always physical changes, as they do not involve breaking any bonds or the creation of new substances. You should be able to read the phase diagram and see how a change in pressure or temperature will affect the phase of a substance. Some particles in a liquid or solid will have enough energy to break away from the surface and become gaseous. The pressure exerted by these molecules as they escape from the surface is called the vapor pressure. When the liquid or solid phase of a substance is in equilibrium with the gas phase, the pressure of the gas will be equal to the vapor pressure of the substance. As temperature increases, the vapor pressure of a liquid will increase. When the vapor pressure of a liquid increases to the point where it is equal to the surrounding atmospheric pressure, the liquid boils. The heat of fusion is the energy that must be put into a solid to melt it. This energy is needed to overcome the forces holding the solid together. Alternatively, the heat of fusion is the heat given off by a substance when it freezes. The intermolecular forces within a solid are more stable and, therefore, have lower energy than the forces within a liquid, so energy is released in the freezing process. The heat of vaporization is the energy that must be put into a liquid to turn it into a gas. This energy is needed to overcome the forces holding the liquid together. Alternatively, the heat of vaporization is the heat given off by a substance when it condenses. Intermolecular forces become stronger when a gas condenses; the gas becomes a liquid, which is more stable, and energy is released. As heat is added to a substance, the temperature of the substance can increase or the substance can change phases, but both changes cannot occur simultaneously. Therefore, when a substance is changing phases, the temperature of that substance remains constant. You should recognize how the phase diagram for water differs from the phase diagram for most other substances. 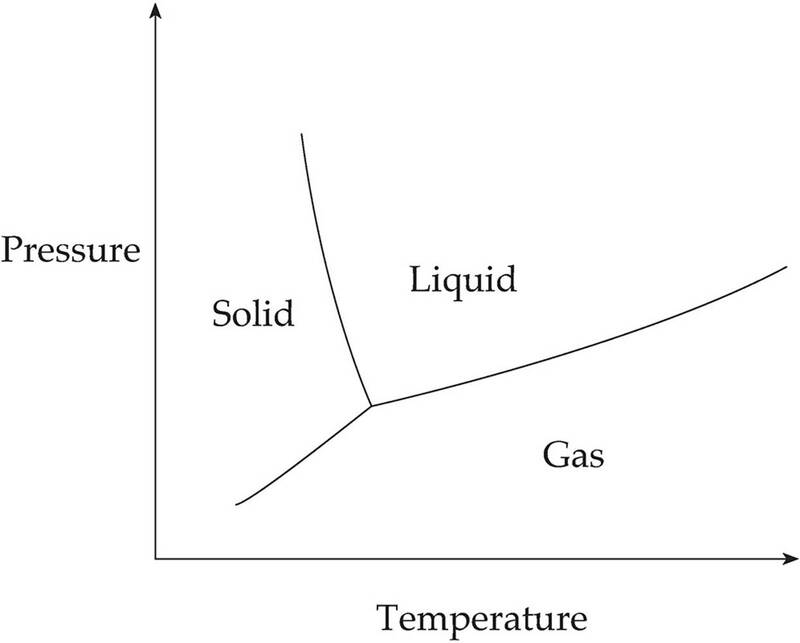 In the phase diagram for substances other than water, the solid-liquid equilibrium line slopes upward. In the phase diagram for water, the solid-liquid equilibrium line slopes downward. What this means is that when pressure is increased, a normal substance will change from liquid to solid, but water will change from solid to liquid. Water has this odd property because its hydrogen bonds form a lattice structure when it freezes. This forces the molecules to remain farther apart in ice than in water, making the solid phase less dense than the liquid phase. That’s why ice floats on water, and this natural phenomenon preserves most marine life.